The Lake Powell Research Project (formally known as Collaborative Research on Assessment of Man's Activities in the Lake Powell Region) is a consortium of university groups funded by the Division of Advanced Environmental Research and Technology in RANN (Research Applied to National Needs) in the National Science Foundation. Researchers in the consortium bring a wide range of expertise in natural and social sciences to bear on the general problem of the effects and ramifications of water resource management in the Lake Powell region. The region currently is experiencing converging demands for water and energy resource development, preservation of nationally unique scenic features, expansion of recreation facilities, and economic growth and modernization in previously isolated rural areas. The Project comprises interdisciplinary studies centered on the following topics: (1) level and distribution of income and wealth generated by resources development; (2) institutional framework for environmental assessment and planning; (3) institutional decision-making and re- source allocation; (4) implications for federal Indian policies of accelerated economic development of the Navajo Indian Reservation; (5) impact of development on demographic structure; (6) consumptive water use in the Upper Colorado River Basin; (7) prediction of future significant changes in the Lake Powell ecosystem; (8) recreational carrying capacity and utilization of the Glen Canyon National Recreational Area; (9) impact of energy development around Lake Powell; and (10) consequences of variability in the lake level of Lake Powell. One of the major missions of RAW projects is to communicate research results directly to user groups of the region, which include government agencies, Native American Tribes, legislative bodies, and interested civic groups. The Lake Powell Research Project Bulletins are intended to make timely research results readily accessible to user groups. The Bulletins supplement technical articles published by Project members in scholarly journals. 1971 - First Progress Report. Anderson. 1972 - Proposal To NSF. Anderson. 1973 - Second Progress Report. Anderson. 1974 - Proposal To NSF. Anderson. 1973 - Some Consequences Restricting Maximum Elevation Lake Powell. Anderson. No. 1: Mercury in the Lake Powell ecosystem. No. 2: Demographic Change Among the Hopi and Navajo Indians. No. 3: Air quality in the Lake Powell Region. No. 4: Legal-political History of Water Resource Development in the Upper Colorado River Basin. D. Mann. September, 1974. No. 5: Geochemistry Lake Powell. Reynolds. No. 7: The Impact of Power Developments in the Navajo Nation. No. 8: Theoritical Analysis Air Quality. Williams. No. 9: Science Information in the Decision to Dam Glen Canyon. P. Perkins. May, 1975. No. 10: A Case Analysis of Policy Implementation (NEPA). Cortner. No. 11: Macroeconomic Impact Energy Development. Schulze. No. 12: Mangement of Collaborative Science. Anderson. No. 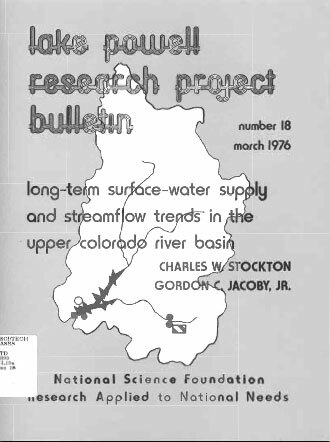 14: An Overview of the Effect of Lake Powell on Colorado River Basin Water Supply and Environment. G. Jacoby. November, 1975. No. 16: Bacterial Contamination of Lake Powell Waters: An Assessment of the Problem. D. Kidd. December, 1975. No.18: Long-term Surface Water Supply and Streamflow Trends in the Upper Colorado River Basin. Stockton and Jacoby. March, 1976. No. 22: The Effects of Power Production and Strip Mining on Local Navajo Populations. No. 24: Water Policy and Decision-Making in the Colorado River Basin. 1976. No. 26: Air Pollutants Generating Stations. Walther. No. 27: Navajo Environmental Protection. Cortner. No. 28: Boomtown Impacts of Energy Development. Ives. No. 29: Shoreline ecology of Lake Powell. September, 1976. No. 30: Kaiparowits Handbook: Coal Resources. No. 33: The impact of energy development on recreation use and value in the Glen Canyon National Recreation Area. November, 1976. No. 37: Macroinvertebrates and diatoms on submerged bottom substrates, Lake Powell. Potter. March, 1977. No. 38: Costs of transporting coal from the Kaiparowits Plateau to Southern California. March 1977. No. 43: Energy Decision-Making. Cortner. No. 44: Shoreline Materials Geologicacal Strata. Potter. No. 46: Modeling Pollutant Concentrations. Williams. No.48: Evaporation, Bank Storage, and Water Budget at Lake Powell. G. Jacoby. July, 1977. No. 50: Transportation of Energy. Anderson. No. 52: The excellent but deteriorating air quality in the Lake Powell Region. September, 1977. No. 53: Kaiparowits EIS. Ingram. No. 57: Boomtown Consequences. Little. No. 63: Analysis of metallic cations in the Lake Powell ecosytems and tributaries. Kidd. June, 1978. No.64: Sedimentation in Lake Powell. W. Condit et al. June, 1978. 1969 - Bank Storage. Murdock. 1992 - Lake Powell Water Quality. Tinkler.